UPDATE: “NBC Nightly News” apologized for the error on Tuesday’s newscast. 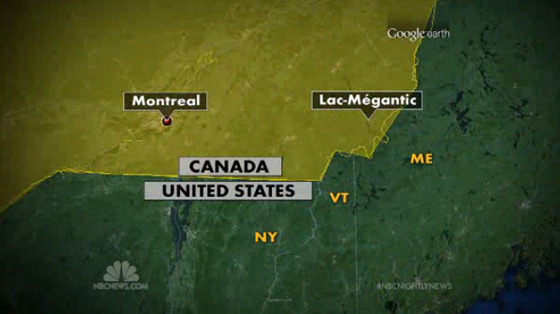 In its report on the train accident in Quebec on Monday’s edition, “NBC Nightly News” aired a helpful fullscreen map showing viewers the location of the derailment, but, in the process, managed to remove an entire state from its map. Using a Google Map powered graphic as a template, the network labeled New Hampshire as Vermont and New York lost its Vermont border. Hopefully no one will tell Chris Matthews or Rachel Maddow — they’d no doubt be bummed their parent network removed the site of the key New Hampshire primaries. The network also decided to highlight Canada in yellow, but did a rather sloppy job tracing the border, especially toward the eastern side of the map. RELATED: TV blog FTVLive.com spotted another typo today: KIRO-TV replaced the city name “Cairo” with its own call sign.